The Post-Valentine Conversation Heartstravaganza continues with this look at rare conversation heart varieties. We like to imagine that we found these hearts in some archaological excavation which involved crawling through Viennese catacombs, pushing open an ancient coffin, and finding this bag of candy hearts clutched in the skeletal fingers of an ancient knight. It didn't happen like that. Archaeology isn't all glamorous underground adventure; it's lots of painstaking work involving sifting through tons of dirt and keeping meticulous records in dozens and dozens of identical marble notebooks. That's why we let Sir Arthur Evans do the work of finding the hearts, and then we beat him savagely and stole them. Everyone at Lance and Eskimo has experienced the pain of breakup, from Lance and Eskimo themselves down to the lowliest Food and Beverage Goblin. That's why these Broken Hearts have a special place in the yawning cavity where our heart used to be before he/she RIPPED IT OUT OF OUR CHEST!!! Broken Hearts, originally called "Job's Comforter Hearts," are a great way to wallow in your misery after a tragic breakup. 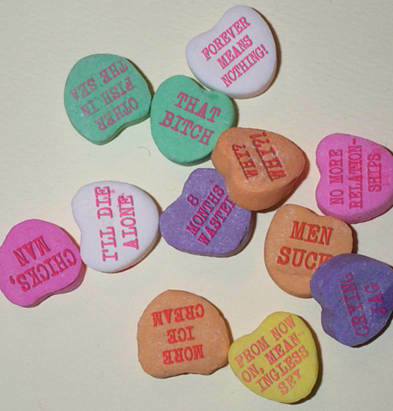 You may notice that these candy hearts taste bitter. That's not irony, that's aspirin, to take away some of the pain you're feeling. Just remember: don't eat too many or you'll die! This brand of candy hearts is Necco's attempt to reel in the goth crowd. Its lack of success may be due partly to the bright pastel colors, which just don't sell well to the vampyre set. We must have sent Necco a thousand emails. "Black and red, black and red," we told them. "Bram Stoker wouldn't eat pastel candies." All Necco did was laugh eerily and set off at a loping run into the fog-bound moor, never to be seen again. These hearts speak for themselves. Unfortunately, what they say can best be described as a "word salad." When we bought Crazy Hearts, we expected them to say stuff like "Crazy 4 U" and possibly "Yoinks!" Instead, we got a glimpse into one confectioner's descent into madness. That was alright with us too.